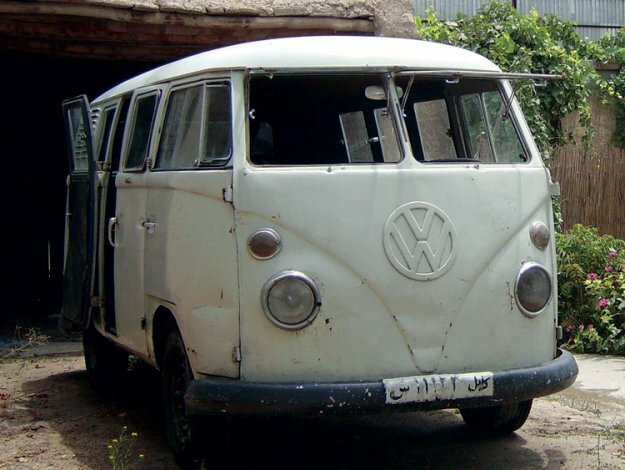 In 2008, when Aurélien was working in Kabul as a graphic designer for several NGOs, he happened upon a vintage VW bus in a delapitated garage behind the Kabul airport. Specifically designed in the 1960s for the Afghan market, it came equipped with a serious dust filter and supersonic shock absorbers. With its toy-like design and storied past, the bus inspired the photographer and artist to explore the rough—but enchanting—Afghani terrain with his camera. The only thing that kept Aurélien from embarking on the journey was the loss of the bus itself. Several weeks after purchasing it, the bus was stolen via forklift by a particularly industrious group of bandits. Fast-forward three years: not only did Aurélien retrieve his bus, he fully renovated and outfitted it for the journey of his life: a 5300-mile trip from Kabul to his hometown of Rochefort, France along with his wife and two of his closest friends. On April 5th, French filmmaker Diego Ongaro, French photographer Landry Dunand, artist Molly de St Andre and Aurélien himself will embark upon what promises to be a kaleidoscopic adventure: a 5300-mile pilgrimage across distant and little-understood lands in a bus with a camera obscura photobooth jutting out from the back. Every moment will be caught both on both film and on camera. Are you ready for the ride? Although its owner, Aurélien, discovered this particular bus in 2008, the hero of this story is actually 44 years old. Made in Germany in the 1960s, this VW minibus was manufactured specifically for the Afghan market and is one of the only remaining models of its kind. Equiped with safari windows, a special dust filter, super strong shock absorber, special vent for the engine right under the roof to get cleaner air, it was designed to endure the dusty terrain and spirited road conditions that Afghanistan is known for. 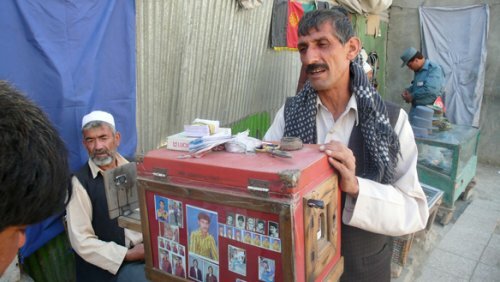 Aurélien purchased the bus in 2008 from Abdul Jalil, Colonel at the Kabul Airport. One year later, after Aurélien had already started renovating it, the bus was stolen from its parking space by a German via forklift. 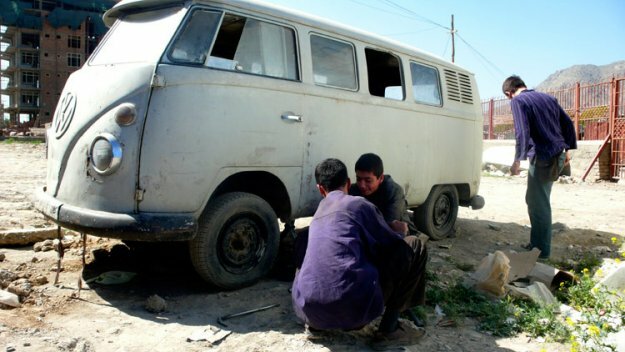 After a long and arduous search worthy of its own documentary, Aurélien located the bus two months later in Kabul in damaged, but salvageable shape. Working with a team of skilled Afghan mechanics, Aurélien had the bus back in working condition in six weeks. An unpredictable and charming symbol of a bygone era, the bus is the protagonist of the story to come. 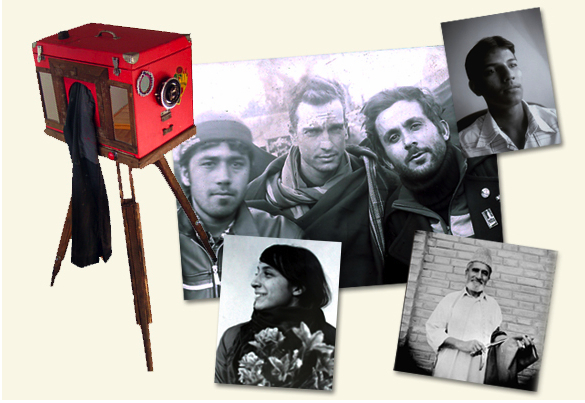 In the 20th century, the camera obscura was a common sight in Afghanistan, used to take identity photographs for administrative purposes. People would queue up to have their photographs taken in makeshift photo booths on the side of the road. They would talk and drink chai tea while waiting for their photograph to develop, watching and commenting on the other portraits underway. 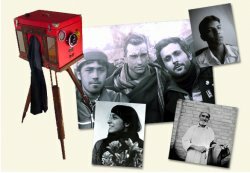 With the advent of the digital camera and the rising cost of film paper, by 2005, there were only 35 photographers in Kabul still using a camera obscura to take such photographs. In 2010, there were only 3. Weighing in at 26 pounds of pure nostalgia, the camera obscura going on the Combi-Nations tour is one of the only ones left in Afghanistan. The camera obscura, or sténopé, is a wooden box with a lens on one side that allows light to enter. Inside the box, there is a piece of sanded glass upon which the image appears. By keeping the lens open for just the right amount of time, the image can be captured onto photo paper. This wooden box is a virtual black room: it has two containers inside of it, one for the fixer and one for the developer, making it possible to take and develop stunning black and white pictures on the road. The bus will be transformed into a mobile photo studio, with two curtains and a backdrop protruding from the back of the bus. The goal is to photograph the people encountered on the journey using exactly the same set up across 11 countries. 5300 miles of faces. Along with the filmed documentary of the voyage, this collection of photographs will be an invaluable way to share the Combi-Nations story. To reach France from Afghanistan, the Combi-Nations team will drive through 11 countries: Afghanistan, Iran, Turkey, Greece, Albany, Montenegro, Slovenia, Croatia, Italy, and France. Afghanistan/Turkey, then Turkey/France. Because of the heightened violence in the south of Afghanistan, the team won’t be able to drive the bus themselves from Kabul to Herat, because they would have to traverse Kandahar. Thus, at this junction of the journey, the bus will be shipped through the most dangerous part of the country while the team flies to meet it at the edge of Herat. From there, the Combi-Nations team will enter Iran and drive to Mashad. They hope to visit the renowned Gulestan, or “Country of Flowers” before travelling onto Turkey to meet Aurélien’s wife, Molly, in Cappadocia. After that, they’ll head to Istanbul, where the bus will be looked over by a mechanic to make sure it is ready for the last leg of the journey. The actual villages and towns visited in each country will be decided by the people, recommendations and stories encountered along the way. In this way, the Combi-Nations trip is an interactive journey fueled by generosity and adventure. 35 years old, he combines his passion for graphic arts and travel as much as possible. For 10 years, his work in graphic design has taken him to the Indian Ocean, Afghanistan, Turkey and France. He is now based between La Rochelle, France and The Berkshires, US, where he has a screen-printing company called Moho Designs with his wife. Painter, graphic designer, Industrial designer, and restorer of vintage vehicles, he focuses all his energy on achieving his dreams and his crazy projects. 30 years old, graphic designer and photographer. During the two years he spent in Afghanistan, he explored the possibilities of the camera obscura (the grand father of the modern camera). His pictures show the everyday life of the people who live and work in Afghanistan against the backdrop of war. His work is displayed at the French cultural center in Bangkok and was published in numerous magazines. He lives currently in Bangkok, Thailand, where he just finished building his piloti house. 34 years old, Director. In 2005, Diego directed and produced “Me, My Bag and My Ball,” a short film that won the prestigious Canal Plus prize at the Clermont Ferrand Short Film Festival. Working on both sides of the Atlantic, his other short films have been garnering selections and awards in film festivals across the globe. His films, often inspired by the innocence of childhood, follow daydreamers attempting to navigate the ordinary world in an extraordinary fashion. He joined the Combi-Nations project in 2010 with the idea of making a documentary on it, and has been living in the forests of western Massachusetts since 2007. His favorite food group is Nutella. 31 years old, artist. Sign language teacher, she spent two years in Kabul working for the Turquoise Mountain Foundation as the curriculum director of their academy of art. She also worked with Deaf children and orphaned children in Afghanistan doing yoga based psychosocial rehabilitation programs. She launched her own screen-printing company in 2006, which she is running from the Berkshires of Massachusetts. Molly’s official role is Coordinator of Logistic on the trip.